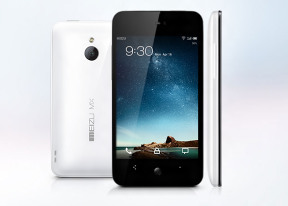 The pretty basic phonebook on the Meizu MX 4-core is almost identical with what we saw in the dual-core Meizu MX. At its core is a list of all contacts but you can view only a specific group or filter where contracts come from - phone contacts, email account or a Meizu account. You can't add Facebook or Twitter or any social network out of the box. Installing the Facebook or Twitter app will allow you to sync your contacts from there. You can link contacts, but the functionality is annoyingly limited. The phonebook will automatically link contacts with the same name, but that's it. You can't manually link or unlink contacts. Viewing a contact's info shows you all the available details and that's about it. We liked how phone numbers are listed though - the whole line is a button that will dial the number, but there's a message icon to the right to send a text message instead. The phonebook integrates with the phone app and the call log. The only new addition to the phonebook is the search field at the top of the contact list in addition to the alphabetical scroll. Just like the dual-core MX, the Meizu MX 4-core had no reception issues and the in-call audio was good, though not very loud even at the loudest setting. The dialer of the Meizu MX 4-core lacks smart dialing but it does have one interesting trick - dial a number and it will tell you the country (e.g. "United States" for a number starting with +1, "United Kingdom" for +44 and so on). Another interesting trick is the built-in blacklist, which allows you to prevent phone numbers not on your contact list from phoning you and filter calls from selected numbers. There's also an option for automatic recording of your calls, which is a pretty cool feature to have if you are absent minded. During a call, the proximity sensor will lock the screen when you lift the phone up to your face. There's an option for the phone to vibrate when the call is connected, so you won't miss it. The call log is the first tab of the telephony app and it keeps a list of all your recent calls. To set a custom track as a ringtone you need to copy it to the designated Ringtones folder, which will make it accessible in the Settings menu. You can't just use the music player like on most Androids. We ran our traditional loudspeaker test on the Meizu MX 4-core and it scored a Good mark. Here's how it stacks up against the competition. You can learn more about the testing procedures over here. The messaging department is quite straightforward: there are no folders here, just New message, Search and Settings buttons. Above is a list of all your messages organized into threads. When composing a message, the input field starts out at only one line tall, but will grow to up to seven lines if need be. Left of the text box is a button that handles attachments and smileys. When you add multimedia content to the message, it is automatically turned into an MMS. You can either quickly add a smile, a photo or an audio file to go with the text or compose an MMS using all the available features (like multiple slides, slide timing, layout, etc.). The multiple slides are all shown inside the compose box. Batch operations are enabled for multiple threads - Mark as spam and Delete are available. Digging deeper into Settings you'll come across the so-called Flyme Messages. If you turn this on and log in with your Flyme OS account, you'll be able to send free messages (text or multimedia) to other Flyme-enabled devices - just like the iOS iMessages. Moving on to email, we were surprised to find the default Gmail app is missing. You could always download it from the Play Store though (if you live outside China, where the Play Store is not available). Meizu have tweaked the generic email client instead and decided it would be enough for all your email accounts. It supports multiple Exchange, POP or IMAP inboxes and you have access to the original folders that are created online, side by side with the standard local ones such as inbox, drafts and sent items. Switching between accounts is pretty easy. The top row holds two labels - the first is the name of the current folder (tap to change the folder) and the one next to it is the name of the account you're currently using (again, tap to change). There's no combined inbox though. There's support for batch operations - Mark, Filter and Delete are the available options. Filter acts against spam to weed out unwanted email addresses. There's also the option to switch to threaded view in which case an icon appears alongside the name of each thread, giving you the number of messages inside. Text entry is handled by a custom keyboard (completely redesigned from the previous Flyme OS iteration) with well-spaced keys. It's quite easy to use and the reasonably big screen helps too. Weirdly, there's no landscape mode anywhere in the messaging department, so you'll rarely get to use the roomier landscape keyboard (it is available in apps that support landscape).